CALLING ALL UNDERGRADUATE STUDENTS ACROSS INDONESIA! 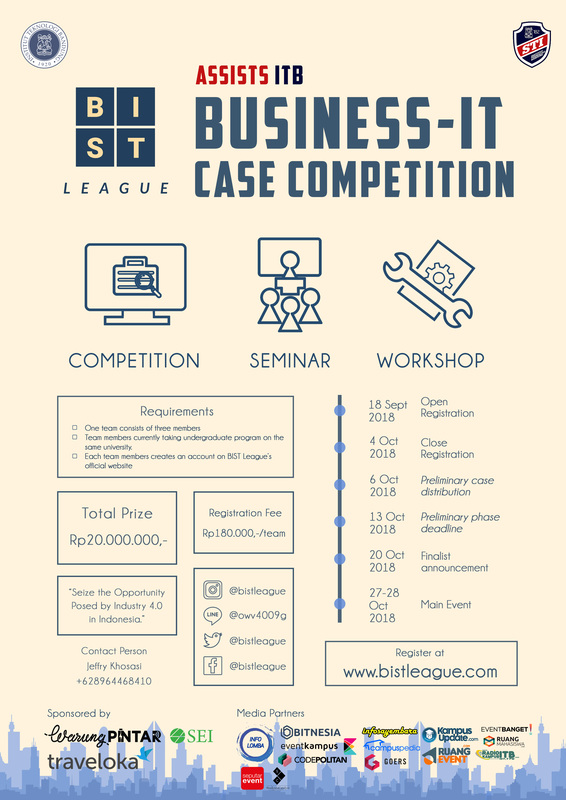 Bist League ITB is a National Business-IT Case Competition held by Institut Teknologi Bandung Association of Information System and Technology Students. Business-IT case is challenge for all of you to rethink how IT could help company to solve business problem. As young generation of Indonesian has to be well prepared for Industry 4.0, there will also be Industry 4.0 seminar and workshop about the good and right way to create a business plan for you to join! Don’t miss the chance to participate in this challenging competition and get yourself prepared for the Industry 4.0 journey with us! Register yourself NOW because big prizes are about to come to you! Seminar = 100 orang, Workshop = 40 orang.